Land Rover Hinsdale is proud to announce that they recently received the accolade of being the number one Certified Pre Owned Land Rover sales volume dealer in the Country. We could not have done this without our loyal customers. We take pride in our newly revamped CPO Program, and are glad that we can provide this kind of value and selection to our market. Land Rover Hinsdale is proud to announce that they recently received the accolade of being the number one Certified Pre Owned Land Rover sales volume dealer in the Country. Land Rover Hinsdale sold a total of 35 CPO vehicles in April 2014, making them the top dealership in the Region for sales volume in April, and also pushing them up to #1 in the nation for the year. With the new Land Rover inventory going out the door as fast as it arrives, the Certified Pre Owned Land Rovers at Land Rover Hinsdale have provided an alternative luxury car market for their eagerly awaiting clientele. The Land Rover Hinsdale CPO program was recently revamped, which makes the enticing CPO vehicles on their lot some of the best values in the Chicagoland luxury car market. 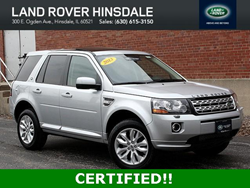 Certified Pre-Owned vehicles at Land Rover Hinsdale go through a rigorous inspection process in order to qualify, so customers can rest assured that they are getting only the best quality pre-owned luxury vehicle. This month Land Rover Hinsdale has made the purchase and trade-in process simpler by instituting a complimentary 19-minute appraisal program, which outlines the current value of your vehicle. The appraisal information is given as a courtesy to help give customers an idea of their vehicle’s value, and plan for their future automotive needs. If customers decide they are interested in a trade-in, or selling their pre-owned luxury vehicle outright, the knowledgeable staff members at Land Rover Hinsdale are ready to assist. 19 minutes is just enough time to get a complimentary Starbucks in their customer lounge area.